To add notification to your page simply click on notification shortcode button, that can be found integrated in default editor panel in visual mode. See image below. 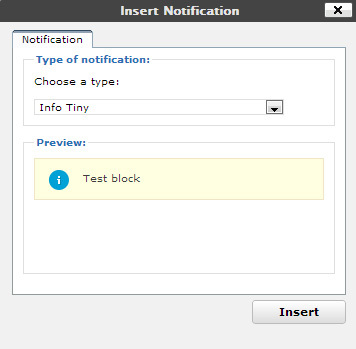 “Type of Notification” option allows you to choose one of the 8 available notification types: “Successful”, “Error”, “Info”, “Warning”, “Successful Tiny”, “Error Tiny”, “Info Tiny”, “Warning Tiny”. Choose the one you need and it will be possible to preview it in block below.